A Cirrus SR20 small plane crashed into a parked car near Houston’s Hobby Airport, leaving 3 people dead. All 3 of the deceased were onboard the plane when it crashed, and no other injuries were reported. The car, which appeared to be a black Honda, was empty according to a witness who spoke with KPRC. Experts speaking to KPRC say that the 3 plane occupants’ deaths were due to the hard impact. 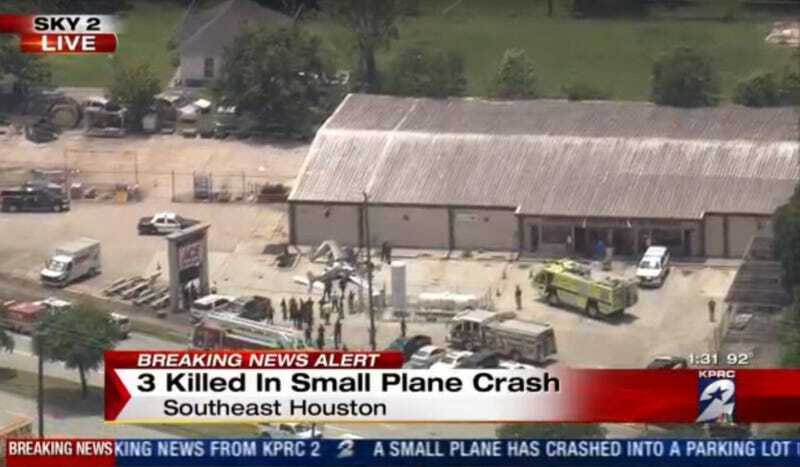 The plane crashed into the parking lot of an Ace Hardware store three blocks away from Hobby Airport just after 1:15 p.m. Central time. Witnesses reported a loud sound in conjunction with the crash. There was no fire and no hazardous materials spilled as a result of the the crash. Thankfully, the plane also missed two propane large storage tanks in the Ace Hardware lot. The fixed-wing, single-engine Cirrus SR20 has a parachute that can be deployed during landing issues that was not deployed in this incident, according to an expert who spoke with KPRC. The plane was also registered in Oklahoma, per KTRK. We have been told by friends at the family business in Oklahoma that they believe Jerry Gray, his brother Tony Gray and Tony’s wife Dana Gray were all on the plane headed from Norman, Oklahoma, to Houston to visit Jerry and Tony’s sick father, who is being treated at MD Anderson Cancer Center. There was some confusion between the pilot and the tower at Hobby Airport as to which runway and landing path to use, but the cause of the crash remains under investigation.